You must be already familiar with Stratus Clouds. This type is one of the more common clouds as these are the cloud formations dominant in the sky when you describe a cloudy day. They are hazy, plane and unremarkable, not unlike a fog. They cover the sky, effectively blocking the sun, thereby rendering a gloomy atmosphere. Stratus clouds refer to low level clouds often called mists or fog when they are found close to the ground. As this cloud type is composed of thin layers of clouds covering a large area of the sky, its name was derived from the Latin term stratus which means “layer”. It develops as a result of the rise of a large air mass into the atmosphere which eventually condenses to form clouds. Stratus clouds may produce light rain showers or snow if under sub-zero temperatures. If enough moisture is gathered at the cloud level, it may progress into a nimbostratus cloud and bring heavy precipitation. At What Height is Stratus Clouds Found? Stratus clouds can be found at altitude around 6,500 feet above the ground. They are largely made up of water droplets and may sometimes contain ice crystals in sub-zero temperatures. They may not bring much turbulence, but stratus clouds can cover the nearby terrain when they develop near the ground especially in uphill areas. For this reason, stratus clouds are significantly noted by pilots during flight because they obstruct visibility which may lead to accidents. What do Stratus Clouds Look Like? Stratus cloud is distinguished by its long horizontal layers of sheets of clouds which give a fog-like effect or overcast sky. These clouds exhibit a ragged appearance with dark gray or nearly whitish color and cover hundreds of miles across the sky. Their thickness varies from translucent cloud layers or sheets to cloud decks of about 1,500 feet. How do Stratus Clouds Form? Stratus clouds can form in two ways. First, they may develop as a result of the rise and condensation of a large air mass. This happens due to extremely weak vertical currents of air which lift huge amounts of moist air as a result of an advancing warm front or wind that drives warm air onto the rising terrain. Stratus clouds may also form from the cooling of moist air. When fog is warmed by the sun, it will rise and eventually condense forming stratus clouds. This is usually seen over lakes. 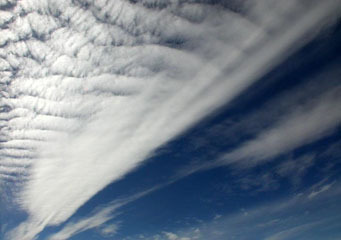 Stratus clouds exist in several species and varieties. This form of stratus cloud develops due to wind gusts that cause separation of several cloud filaments which change appearance rapidly. These are featureless gray stratus clouds that form in cool and stable conditions when moist air moves onto a water or cold ground surface. Stratus nebulosus also develops from the overnight rising of fog. Stratus Opacus can be easily distinguished as the cloud form that completely or partly covers the sun or moon. Stratus cloud of this variety displays a wave-like undulation. This form of stratus cloud comes with precipitation through ice prisms, snow grains or light drizzles. Stratus translucidus exhibits a veil-like pattern that clearly outlines the sun and moon. How common are Stratus Clouds? Stratus clouds are very common all over the world most especially in the coastal and mountainous regions. This is because the ascent of weak vertical air currents occurs on uphill areas and coastal surfaces. The next time you see low-lying clouds with a gray hue, you know that they are stratus clouds. Although they may not produce heavy rainfall, these clouds are good indicators that a warm frontal system is advancing.